I’ve been in the shop every chance I get working on these chairs (technically back stools). Mostly things have progressed reasonably well. The first thing I tackled was turning the six legs. This is a first for me. 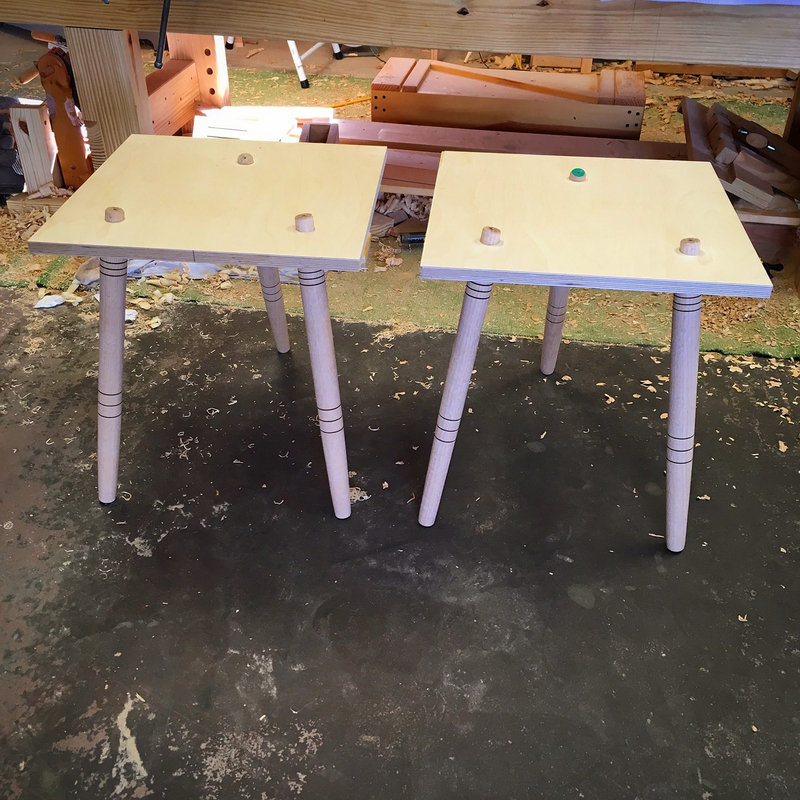 Up until now all of my legged projects have received tapered octagonal legs. For these chairs though, I wanted a leg that leaned a little more toward mid-century modern/Danish. 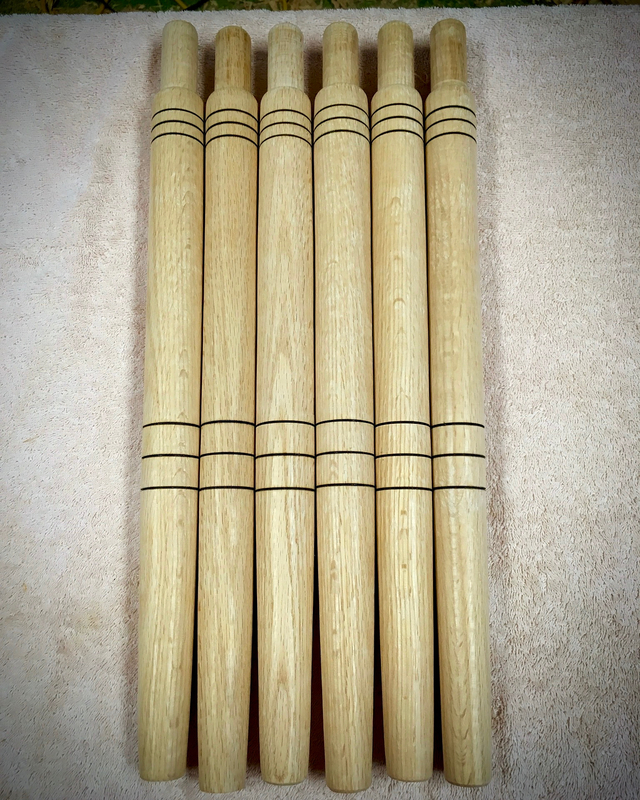 So a simple tuned leg with a very slight taper along its length towards the floor. The legs went pretty quickly. I managed to get almost two per evening after getting home from work. 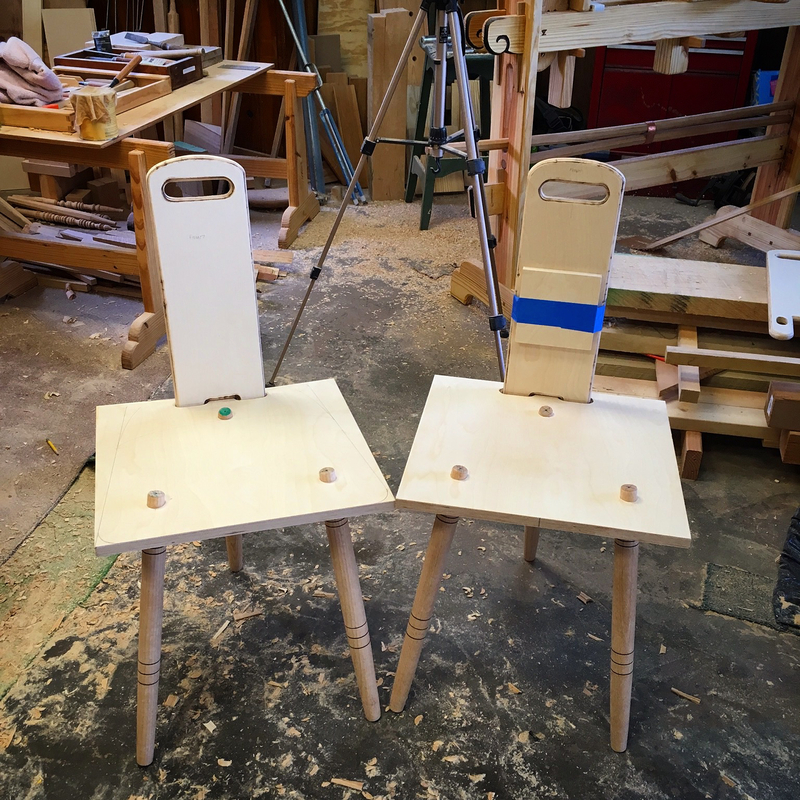 Next up was drilling the glued up seat blanks for installing my freshly minted legs. Same old, same old. Set a bevel gauge, chuck a 1″ bit in my brace and bore away. I’m really liking the cylindrical tenon option over the tapered tenon approach. I’ve also discovered that I have a pretty good knack for drilling at the correct angle. At least I managed to drill these six holes without making a mess of things. Creating the mortises for installing the back panel was pretty much the same as installing the legs. The back panel is installed with a 5deg slope. So I once again set a bevel gauge, bored holes and then chopped out the adjoining waste. The mating tenons were straight forward cuts and chopping of waste. Here is where things took a bit of a turn. I knew going in that all of the edges of the plywood would need to be rounded over. Decent plywood responds well to sharp hand tools. At least outer the outer edges do. Shaping internal cuts however, is an entirely different story. Internal cuts such as those of the mortises and the handhold that I added to the back board. I tried just about everything I could think of without finding a satisfactory method. So I had to resort to…rotary power. Many moons ago it seemed that I was helping just about everyone I know install laminate flooring. To tackle the job of cutting holes for HVAC vents I purchased a knockoff Rotozip tool. Basically a mini router. With a spiral up-cutting bit it did a fantastic job of cutting vent holes in laminate flooring. Anyway, I remembered that it had come with a cheapo 3/8″ round over router bit. So this is the setup that I resorted to for rounding over the edges of the plywood. It was loud, dusty and less than enjoyable work, but it did the job. As a consolation prize, the cheap HSS router bit added a little wood burning. So there is that I guess. You can also see in the above photo that I taped one of the back pad into place. This helped me to verify the height and get an idea as to whether or not it would even work. I think it will. I may have to fuss with the thickness of the foam. We will see. Today I managed to turn and fit the stretchers for one of the chairs. I designed these to be beefy. I even went a bit thicker than my design when making them. The intent is to give a feeling of solidity and stability. No one has come out and questioned the three leg design, but I can see the uncertainty on their face when they see it. The strange thing is these same folks didn’t hesitate with the three legged stools that I just finished. Something about adding a back and calling it a chair triggers a reaction in some folks. Even in this raw state the chair is actually pretty comfortable. There is a bit of flex to the back board and its width fits well along my back. So, even though the plywood is a PIA to work with, I think I’m on the right track. I think I’m making pretty good progress. Four days into the “June Chair Build” and I have something I can sit on. Still a long way from putting the finish on, but not too bad. 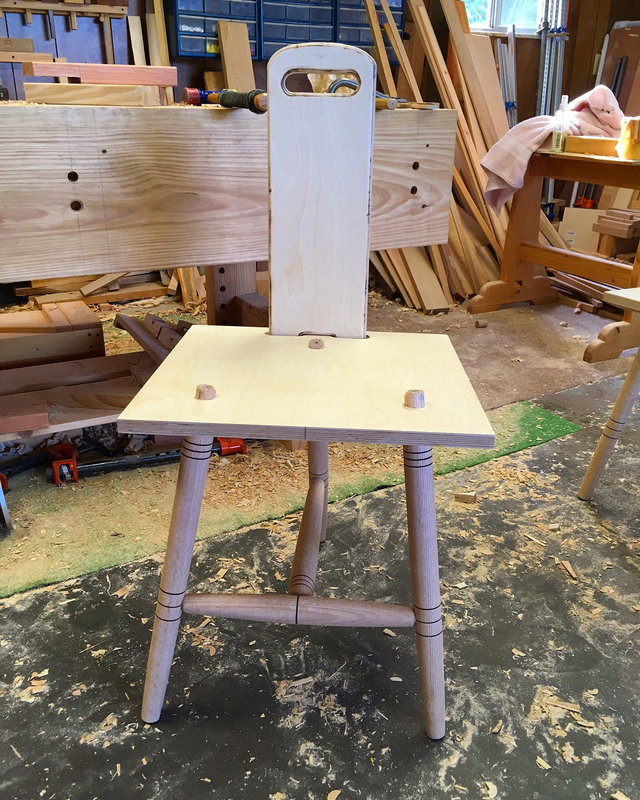 This entry was posted in Chair-3-Ply Moravian and tagged back stool, Moravian Chair, staked furniture, three leg chair. Bookmark the permalink. It’s a bit late now but a coping saw and some files would of done the same thing but admittedly your mini router was faster but none the less the clean up time will probably equate to the same amount of time it would of taken you to do the way I mentioned above. With all these chairs Greg are you planning a wedding, maybe your taking a second wife? Lol don’t let her read this. The electric router is no fun to use, but is probably the most efficient tool for this job. LOL…One wife is already more than I can afford! We typically have 16-20 people over for Holidays and family gatherings. So seating is always in short supply. 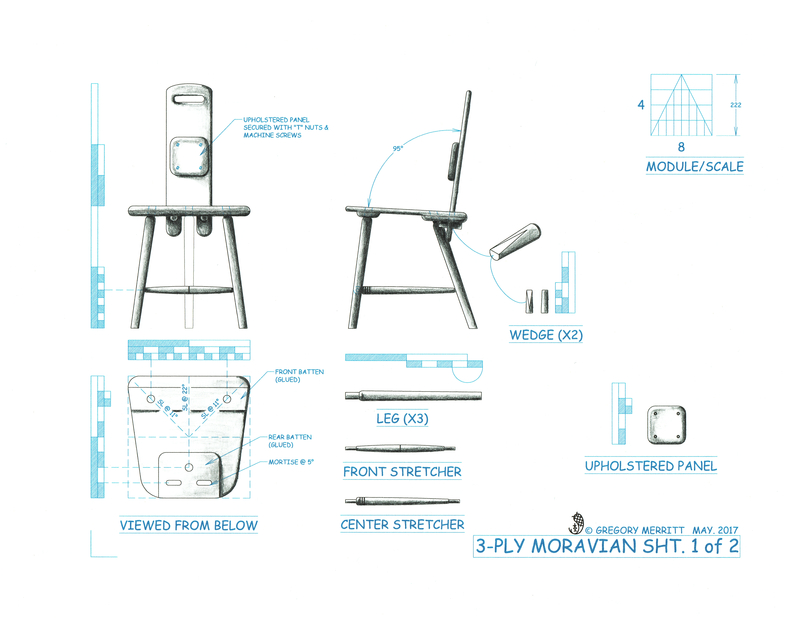 I wont be making that many stools, chairs and benches though. And I feel should remember you – despite I hate your instagram account – … I invited you to the Iberian Peninsula before Brian, I know he is your country man but I assure you and Mrs Manager that I cook better!!!! ps: the chair look great. 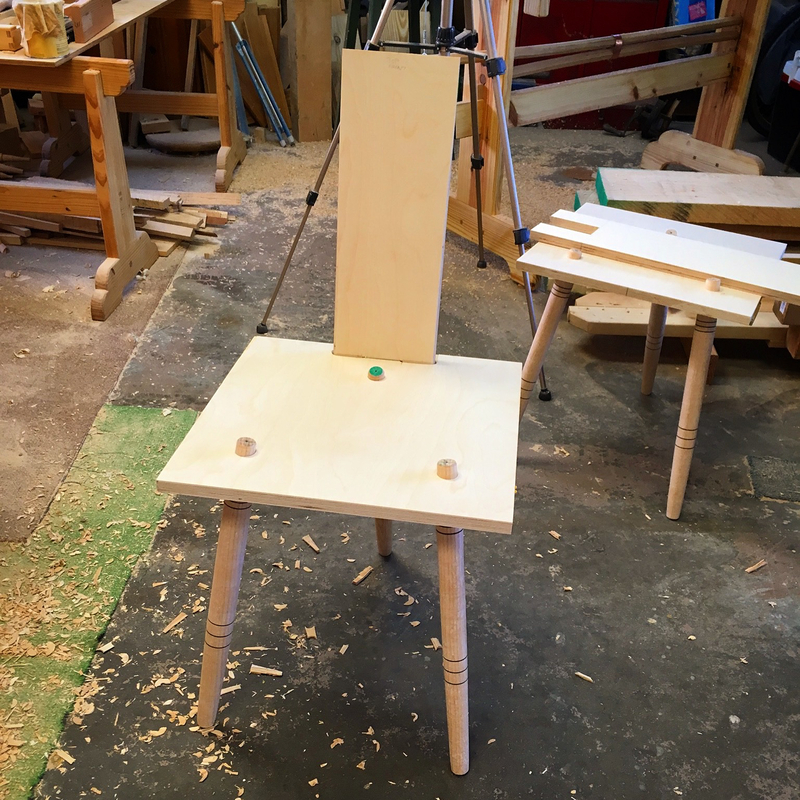 LOL…luckily the protruding leg tenons don’t hit any sensitive areas and you miss the rear one altogether. Everything is virtual. I don’t even have a passport. The last time I left the country was 20 years ago. I used to drive tractor trailer (articulated lorry?) and picked up a load of, ironically, plywood out of Canada. António might cook better, but I know where all the best burger joints are here. The Spanish word for it is so elegant, it makes you feel like it is something really special: Hamburguesería. Nice work on the chairs so far. I think you may have made the right choice for rounding over the edges with your router. Plywood is a PITA. I underestimated my ability to shape plywood edges with hand tools. The outer edges are pretty easy, but the internal cuts…not so much. Unfortunately, the electric router is the best tool for the job. All in all though the build is progressing pretty well. Still on the legs! There’s only eight of them. LOL you have plenty of time. Twenty five days in fact. No pressure. Brian… and Greg… ‘Hamburguesería’ – really!?!? I’m talking about real and “majestic” home cook meals, hamburger are no match to it… so I rest my case! Brian come here for a visit and I’ll show you! The best one I’ve had so far was at a fancy place in Mallorca: A burger grilled to perfection topped with goat cheese, honey, and sobresada, which is like a spreadable version of chorizo. Yummy! Greg, sorry for hijacking your thead. Now I’m done hijacking this thread. ‘Manager’ embrace a new working project and 4 boys and girls from Phd to elementary school. Never a boring moment around though!